Posted on March 23, 2017 at 6:21 pm. Posted on March 23, 2017 at 6:18 pm. 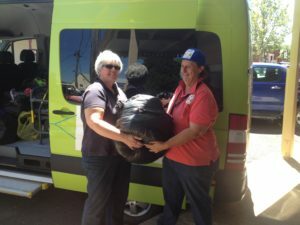 Gunnedah Homeless Connect Day – We need your help! Posted on March 20, 2017 at 5:49 pm. Posted on March 8, 2017 at 6:57 am. Now in its 59th year, NSW Seniors Festival is the largest festival for seniors in the Southern Hemisphere, reaching up to 500,000 seniors each year. Posted on February 26, 2017 at 6:21 pm. Posted on February 26, 2017 at 6:11 pm. Today, The Civic Gunnedah launched its Sensory Sessions with a screening of ‘Sing’. Drop Off a Huge Success – But More Still Needed! Posted on February 22, 2017 at 11:09 am. 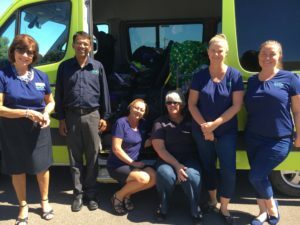 Due to the wonderful response from our community, we were thrilled to deliver a van full of much needed donations to Coolah yesterday. These donations will be gifted to those in need as a result of the recent bushfires in Uabry, Dunedoo, Sir Ivan, Boggabri and surrounding areas. If you would like to donate to the cause – there’s still time! * Pet supplies/ cat & dog food/ poultry feed/ horse feeds. Organisers are also asking for future assistance in the form of plants, seedlings from anyone who may have any type of heritage trees and can propagate them to assist in reestablishment of much loved and therapeutic gardens. Please drop off any items to our Marquis Street Office, 80 Marquis Street Gunnedah. Organisers have asked that we also pass on their gratitude for the thoughtful donations received to date. Posted on February 20, 2017 at 8:11 pm. Seniors Week Festival – What’s On! Posted on February 17, 2017 at 4:37 pm. We are excited to reveal our 2017 Seniors Week Festival Program of Events. So much to do and to be involved in! For more information, please phone the GoCo Team on 6740 2240. Want to donate to the Uabry / Dunnedoo Appeal? We can help! Posted on February 17, 2017 at 4:32 pm. We are taking donations of clothing, shoes, bedding, toiletries and non-perishable food item to send to those who have been touched by recent fires in Uabry, Dunedoo and surrounding areas. We will be delivering donated items to the Coolah Drop off point on Monday Feb 27 and would love to receive any items by 5pm on Friday Feb 24. Please send items to the GoCo Office at 80 Marquis Street Gunnedah NSW 2380. All donations will be gratefully received!